Salzburg is a medium-sized city with a clearly outlined city centre. In this centre, the Old Town or Altstadt, you will find most of the top-attractions. That being said, there are quite a few of them; we therefore recommend a stay of at least two or three days for a full Salzburg experience. For such a stay, read our "standard itinerary". This article aims to help people who are in Salzburg as a stop-over or who come to the city for a conference or business stay and can′t spend more than a few hours or at most one day with Salzburg sightseeing. First of all, note the "must see" ranking in our sightseeing section. 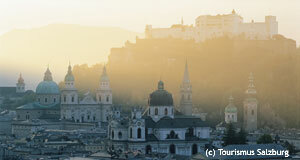 Here you will find a list with the most appealing sights of Salzburg. For specialist interests, see also our directory of Salzburg attractions: It is a somewhat complete list with attractions of the city in alphabetical order and you might discover one or two things that appeal to your personal taste. But now let′s start with the itinerary as such. Note the general division of the Altstadt into two parts, separated by the Salzach river. On both sides, you will find plenty of narrow lanes, charming alleys and piazzas and churches. This is ideal for some strolling and general drifting. However, we would suggest picking a few major attractions: Note the Salzburger Dom, the cathedral, and the ensemble of palaces and churches around it (St. Peter, the Franciscan church, Mozartplatz, the Kollegienkirche and Mozart′s birthplace with the Getreidegasse lane). Note also the Mirabell Castle and Mirabell Garden on the other side of the river. Walk up to the castle, the Fortress Hohensalzburg. If you have the time, do the tour - you will get to the top tower with a stunning view on the city, that along is worth the entrance fee. If you like hiking, walk along the Mönchsberg or cross the river and climb the stairs to the lookout platform of the Kapuzinerberg. Try one of Salzburg′s traditional cafes and in the evening, go to the Müllner Bräu for a stein of Salzburg′s finest beer. If it rains, you might want to go to the Museum of Modern Art (in case there is a good exhibition on) or to the Salzburg Museum, sort of a town museum. If you prefer to get guided to the places of interest, you might want to read our article on guided Salzburg tours.